We scan and convert aperture cards into high-quality digital images. Whether your aperture cards contain engineering drawings, construction plans, building plans, architectural renderings, manufacturing designs, technical drawings, schematics, diagrams or other documents, we can convert and digitize them all. 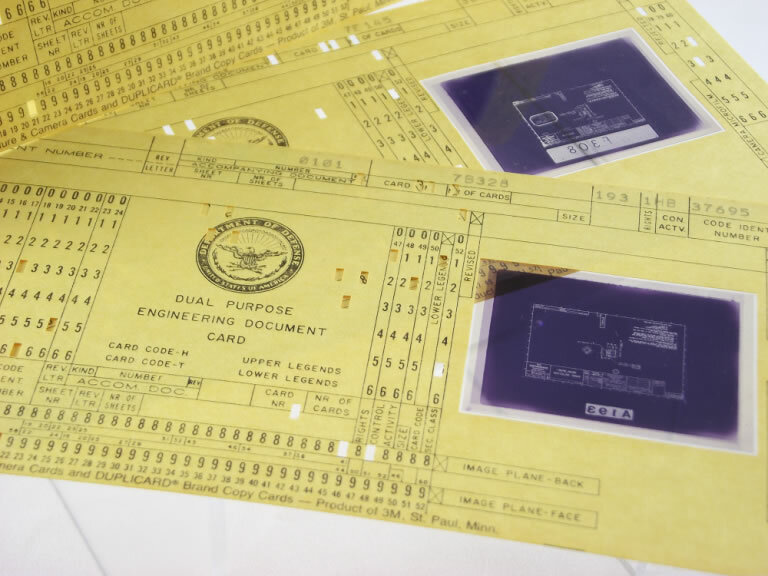 Our sophisticated equipment can read Hollerith data (code in the form of punched holes that is used for indexing) off your aperture cards and provide back valuable information about your documents. In the absence of Hollerith data, we are able to identify printed or handwritten information on the cards and index them manually. You can easily preserve your valuable documents, improve access, retrieval and readability, and save significant amount of time and money simply by converting your aperture cards to digital format. With over 30 years of experience in scanning, indexing and archiving massive volumes of documents, we know everything there is to know about digital conversion of aperture cards. Our conversion services are delivered through our ScanFactory division by qualified, security-cleared personnel that are dedicated to quality aperture card scanning. We use highly sophisticated aperture card scanners that provide exceptional image quality and accurate index data even from cards that are in poor condition or low contrast. The latest digital imaging technology can create significantly enhanced, clean digital images at full resolution (quality is often much better than the original). Our scanners are also capable of automatically extracting Hollerith data (punch data) and automtically indexing aperture card scans. In addition, we use our own proprietary technology to control, streamline and automate all our scanning operations, from A to Z – ScanFactory Resource Planning (SRP). It was developed entirely in-house by our expert personnel. Its main purpose is to reduce human intervention to an absolute minimum and remove the risk of human error. This highly sophisticated, one-of-a-kind technology offers complete traceability and provides full real-time reporting functionality. The Customer Portal allows you to search for and consult the status of aperture cards processed by ScanFactory at any point in time (e.g. In Transport, in Scanning, etc.). The Portal also makes it possible to make requests for on-demand or urgent scanning or physical delivery of your aperture cards, and view full history of such requests. All information and metadata about your aperture cards, including their exact physical location, are stored in the SRP database and can be retrieved on-demand. A set of clearly defined procedures governs every single step of our scanning / conversion process: Pick-up of your aperture cards, Transport & Intake at our facilities, Preparation, Scanning, Indexing, Quality Control, Metadata & Image Delivery. Our experienced consultants will work with your staff to determine the special requirements of your project. All of our procedures are designed to maintain a high degree of quality and accuracy to guarantee your satisfaction. Our ScanFactory operators are highly trained professionals equipped to handle aperture cards with care. Our operators spend the majority of their time on quality control and tweaking images before they are output (not after), so there are no mistakes to correct in the final images. Typically, aperture cards contain large format (wide format) documents such as engineering drawings. However, in some cases, instead of one large image, the aperture cards might contain two, four or more separate images. We have developed methods to efficiently separate multiple images and ensure that they are correctly identified on the card. We audit the quality of separate images and, if corrections are needed, they are done immediately. Final quality control confirms that all the above steps have been correctly implemented. In addition, our SRP system has built-in quality control features (as do all scanners used at ScanFactory). Our Quality Supervisor is automatically notified by the SRP of any quality issues. In our experience it is not unusual that aperture cards are filmed in a variety of different ways. Some aperture cards are inside out, upside down, positive or inverted. We can address all these issues. We perform a number of automated and manual image enhancement functions, such as manual or automatic image rotation, white balancing, cropping, deskewing, etc. Importantly, the SRP Image Enhancement module utilizes a 16-core server dedicated exclusively to post-scan image processing and performs a series of complex algorithmic image enhancement tasks. We can index your documents by automatically extracting Hollerith data (punch data) from your aperture cards. If no Hollerith data are available (simply because not all aperture cards contain punched images), we can identify handwritten or printed information on the cards and index the images manually. Additional services include OCR for text searchable PDF files, unitizing images into documents, and preparing images and index information for import into your back-end databases and systems, such as your DMS, or any other applications. What would you like us to do with your aperture cards once scanned? Aperture Card Vault is a specialized service package that we offer to customers who wish to outsource long term storage of their aperture card archive and have it converted to digital format on-demand. Aperture cards are subject to specific storage requirements. Depending on the type of film mounted in a punch card, it can be susceptible to humidity, dryness, vinegar syndrome, redox blemishes, tears, etc. Special equipment is also required to read data off of them. We will store your aperture card archive in our safe and secure Aperture Card Vault. We will give you access to our Customer Portal where you can search through your entire archive and request particular aperture cards to be scanned, indexed and delivered to you securely in digital format. Let us take care of your aperture cards for you, they are safe with us!